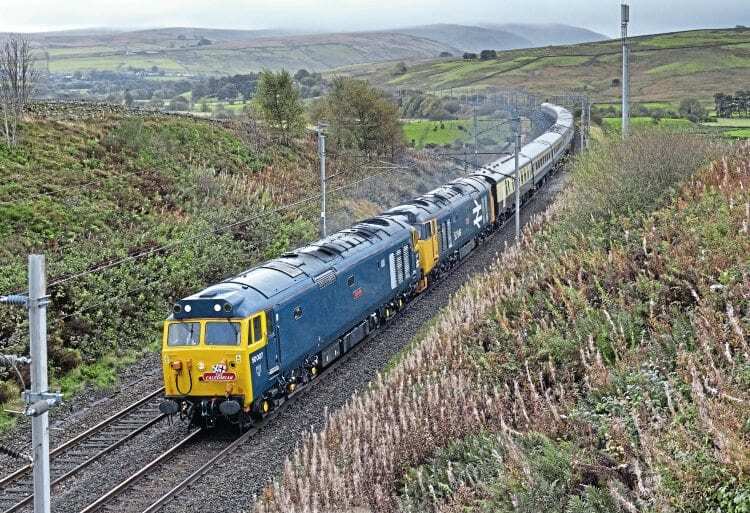 The charity special fronted by The Railway Magazine took a pair of Class 50s from Crewe over Shap and Beattock to Glasgow for the first time in many years. 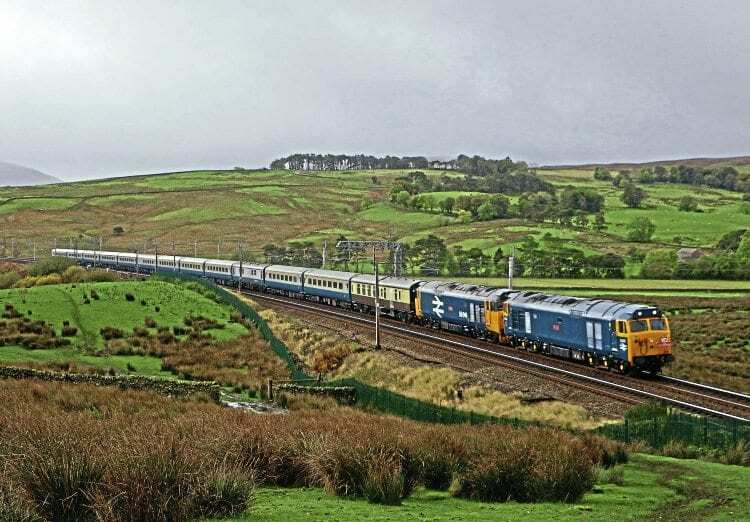 JOHN HEATON FCILT analyses the performance of these veteran diesels that were back on a familiar route, along with a comparison of some historic runs. THE two huge diesel locomotives nosing towards the buffer stops at Glasgow Central certainly attracted a large crowd – not just the usual suspects of railtour regulars, either. At 13.30 on a Saturday afternoon many were curious shoppers and football supporters, who could scarcely believe the train they were observing represented a routine arrival from London in the early 1970s, a decade and more before most of them were born. To anyone who could remember those diesel days north of Crewe the arrival of locomotives Nos. 50007 Hercules and 50049 Defiance represented a victory for the voice of individualism on a railway that has become progressively standardised. One of the benefits Privatisation has brought has been the equal standing of all certified operators when approaching the infrastructure provider, Network Rail, for permission to run. This trip involved a powerful coalition of Pathfinder Tours, Riviera Trains, The Class 50 Alliance, GBRailfreight and The Railway Magazine in bringing the proposal for a 401-mile journey to Network Rail, which responded by finding viable paths from Euston to Glasgow Central among the franchise and freight operators’ requirements. 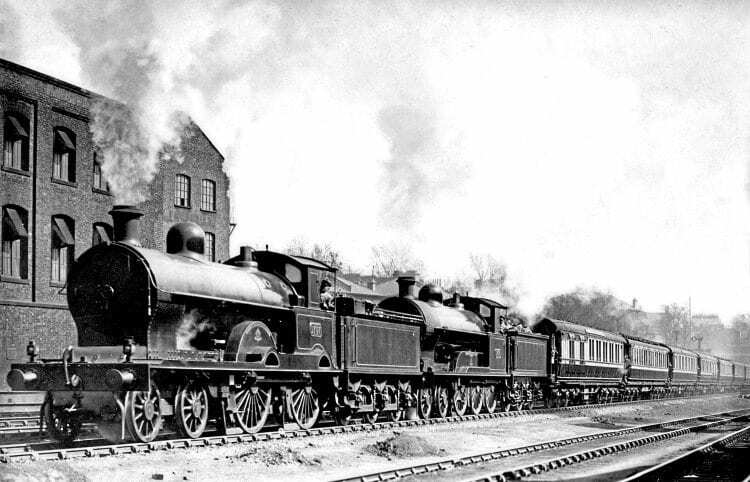 The fact that the special was headlined as a fund raiser for The Railway Children charity probably helped the cause, and it looks as though the resultant donation will be into five figures. It was not without some trepidation that The Railway Magazine editor Chris Milner launched bookings for the tour in the columns of his periodical, but the initiative was immediately justified as the capacity was sold out in just a few days. Marketing was centred on three anniversaries. 2017 marked the 50th year of the popular Class 50s, but it also marked 60 years from the launch of ‘The Caledonian’, a light-load, high-speed, steam-hauled initiative by the London Midland Region of British Railways. The third one represented the 120th anniversary of The Railway Magazine’s first publication. The heady days of planning and marketing are brought back to reality sooner or later, resulting in the operators taking over events at London Euston on a dull, drizzly, dark October morning, tucked out of everyone’s way on platform 1. No. 86101 had brought in the empty stock of 13 coaches needed for the 520 passengers and catering facilities that offered everything from a cup of tea to silver service dinner. In the process of assessing the train’s weight, I approached a gaggle of photographers near the platform end, where resplendent Class 87 No. 87002 Royal Sovereign was standing. There was an era when British Rail electric locomotives used to haul a procession of standard 12-coach trains on E455 timings out of this terminus, and it had fallen to No. 87002 to show what these 44-year-old locos could do on a demanding schedule with plenty of stops to pick up their passengers. Details are shown in Table 1. Platform 1 is not the easiest location from which to start a long train in the teeth of a squadron of up trains, but the 3min late start was nevertheless a disappointment. After reaching 94mph just after Willesden Jct a hefty running brake test brought speed down to 68mph and, although speed recovered to 97mph, 2min were lost to Watford Jct.